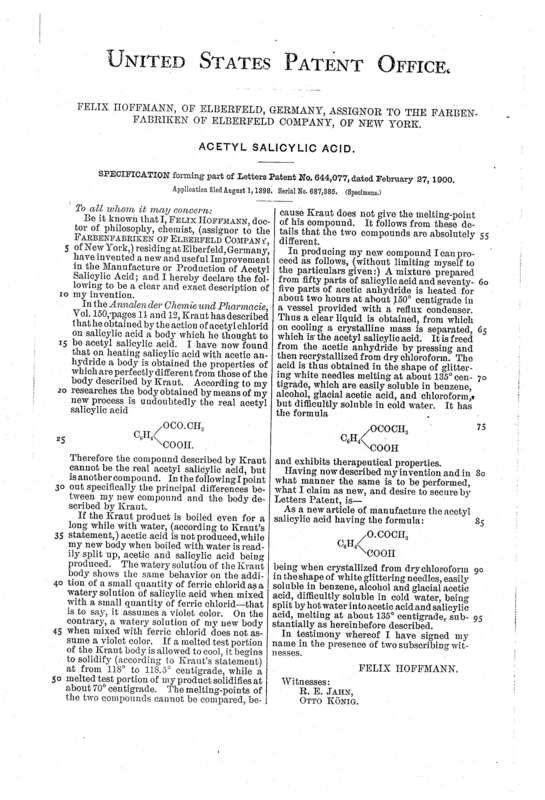 On February 27, 1900, Felix Hoffmann was granted the patent for Acetyl Salicylic Acid, U.S. Patent No. 644,077. Acetyl Salicylic Acid, known today as aspirin, helps to relieve minor aches and pains. Hippocrates, known as the father of modern medicine, documented treatments he found for pain relief. He noted the leaves and bark from a willow tree helped to reduce fevers and other minor pains. He brewed a tea of bark from a willow tree and noted is lessened the pain for women during childbirth. The substance Hippocrates used was later discovered to be a compound called salicin, a compound found in willow trees and many other trees and plants. Many scientists had worked with different forms of salicin but French pharmacist Henri Leroux improved the extraction process and was able to obtain higher amounts of the compound. Italian chemist Raffaele Piria furthered Leroux’s process and manipulated the substance by splitting it. According to Sophie Jourdier of the Royal Society of Chemistry Piria “split salicin into a sugar and an aromatic component (salicylaldehyde) and converted the latter, by hydrolysis and oxidation, to an acid of crystallised colourless needles, which he named salicylic acid.” While this new formula was a success it caused severe gastrointestinal irritation. French chemist Charles Frederic Gerhardt found that adding the buffer sodium salicylate and acetyl chloride (acetylsalicylic acid), corrected many of the gastrointestinal issues. Gerhardt never furthered this discovery but Bayer® did. They asked German chemist Felix Hoffmann, to improve Gerhardt’s formula as they were discovering prolonged use of the drug caused severe nausea, vomiting, bleeding and ulcers. Hoffmann, who had a personal vested interest in this drug, worked on the formula. He tested his improvements on his arthritic father and found the improvements worked; his father was able to take the medication without illness. From there Hoffmann worked with Bayer to get this medication on the market for the masses. Originally, aspirin came in powder form, the first tablet was introduced in 1915, and by then aspirin was available to the public without a prescription. Aspirin is now one of the most widely used treatments of minor aches and pains. It has also been found to help decrease the risk of heart attack, heart disease, stroke and certain types of cancers. Suiter Swantz IP is a full-service intellectual property law firm, based in Omaha, NE, serving all of Nebraska, Iowa, and South Dakota. If you have any intellectual property questions or need assistance with any patent, trademark, or copyright matters and would like to speak to one of our attorneys please contact us.